John and I want to once again thank everyone that came out to listen to us speak. We don’t pretend to have all of the answers, and we would never presume that what we do in our context would be appropriate for anyone else, but we both feel that there is value in the conversation. You can find the references for the presentation HERE. Visual appeal of handouts and self-made classroom materials: Does it matter? Many teachers use their own materials in the classroom and the content of these handouts is only half of the document. The other half is the visual elements: graphics, page layout, typography, etc. While lots of thought and energy went into the creation of content, often the visual elements are ignored (Kelly, 1998). Teachers should be concerned about these elements because research has shown that visual design effects comprehension – the better the document is laid out, the easier it is to understand (Gasser, et al., 2005, Walker, 2001) and the more appealing the document is visually, the more motivated students are to read the document (Smiley, 2004, Misanchuk, 1992). In the presentation I reviewed research related to visual design and offered the following best practices: 1) Use a typeface (font) the students are familiar with (Felici, 2003, Hoener, et al., 1997). 2) Use typography to signal sections of the document (Smiley, 2012). 3) Use increased line spacing and white space (White, 2002). 4) Use lines and shapes to organize the document (Dabner, 2004). 5) Only use graphics with a pedagogical purpose (Misanchuk, 1992, Clark and Lyons, 2011). I also showed numerous examples, both good and bad, that illustrated these best practices. The list of references can be downloaded at this link: Visual appeal of handouts and self-made classroom materials: Does it matter? REFERENCES. 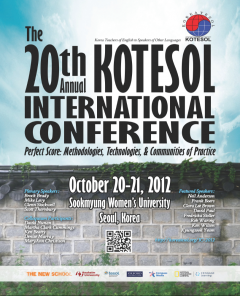 I’m presenting at the Korea TESOL International Conference on Sunday at 9:00 in room M-101. I’ll be speaking on my usual topic of Visual Communication and L2 learners. I will be sharing several visual design best practices for teachers who make the own materials.